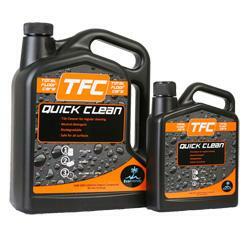 Quick Clean is an economical, hygienic and neutral cleaner for frequent tile cleaning. Quick Clean is easy and safe to use and is streak free. Quick Clean contains no harmful chemicals and is biodegradable. Quick Clean will not attack or break down sealers or polishes. Quick Clean may be used on any tile and hard surface including sealed surfaces. Quick Clean has a pleasant fragrance and is extremely economical to use due to the dilution rate. Mask off any adjacent areas that need to be protected during the application. Mix the solution, apply the solution to the area using a mop, sponge or soft broom.